A 30-year-old Lake Stevens man was killed Tuesday afternoon, and three others were injured, in a three-car crash on State Route 92 and 44th Street Northeast in Lake Stevens, according to the Washington State Patrol. The crash occurred around 3 p.m. on SR 92 – also known as Granite Falls Highway. A station wagon was struck by a Ford 350 pickup truck when the station wagon was pulling onto 44th Street. The station wagon was pushed into another sedan in the wreck. WSP said the crash is still under investigation. No charges have been filed. If you are pulling out of a driveway, place of business or side street, and into traffic, you must always yield right of way to the drivers already on the street you’re turning onto. Whenever you move into the flow of traffic from a complete stop, drivers already moving have the right of way over your vehicle, and you must wait until the traffic clears to proceed. When in doubt, yield the right of way to any vehicle already moving in a forward direction, or any time you’re going from a stopped position into the flow of moving traffic. Right of way rules are common sense and are designed to promote traffic safety. Understanding who has the right of way in each situation can save both drivers. There are countless scenarios on the road where vehicles, pedestrians and other modes of transportation come into contact, and thus interfere with each other’s routes. Right of way determines who goes first. After an accident, right of way is one of the things that is taken into consideration by police when handing out traffic violations. Right of way is also considered by insurance companies when determining fault in an accident. 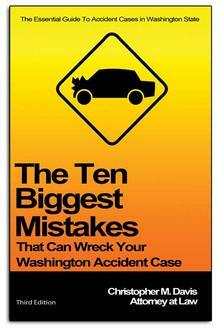 Your car accident lawyer will look at all angles of your collision and how right of way comes into play. Receive a free case evaluation from the Washington state car accident lawyer at Davis Law Group, P.S., regarding your accident. Once you have retained our personal injury law firm, we will diligently represent you in obtaining compensation for your injuries, lost wages and pain and suffering. Contact Davis Law Group by calling (206) 727-4000, using the chat feature below or filling out the contact form on this page.